The Stadthuys (sometimes spelled as Stadhuys), known as City Hall or Town Hall in Dutch, is probably the most prominent attraction and most photographed site in Melaka. Definitely a place that will not be missed. 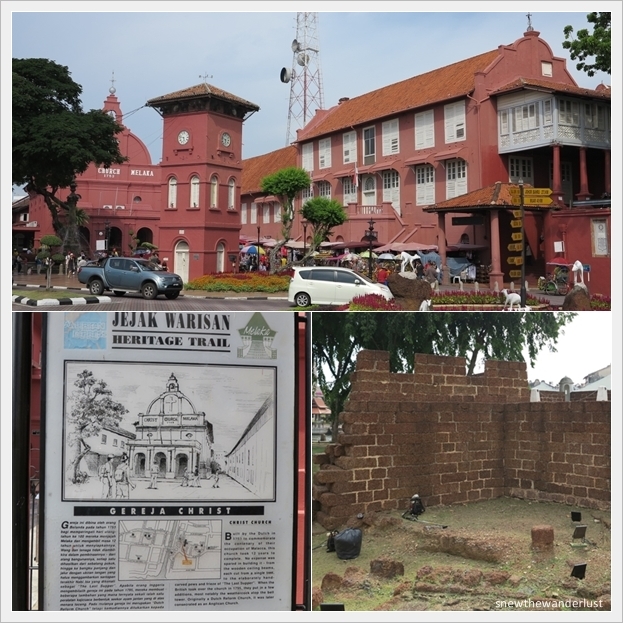 The Christ Church Melaka, Fort of Malacca (A'Famosa), St Paul's Church are some of the historic heritage trail to explore in Melaka. You can also take one of the many trishaws around there for a short trip. One of my friends took it from here back to Hotel Equatorial. Journey took less than 20minutes, and cost around RM20. I would probably try the next round. The trishaws are well-decorated with flowers and LED lights, with loud thumping disco music! Take it at night, and you have a really different and cooling experience. Explore further with the two rows red shop houses before reaching St. Francis Xavier Church. Most of the shops look pretty old-school, and some are not even open. I really wonder how these shops survive. I do find a few interesting ones, selling antiques and tailoring Nyonya Kebaya (Peranakan clothes). This was probably a bit "out of place" from the historical city. The Dutch windmill located on the opposite side of the Stadthuys. Oh yes, I forgot. 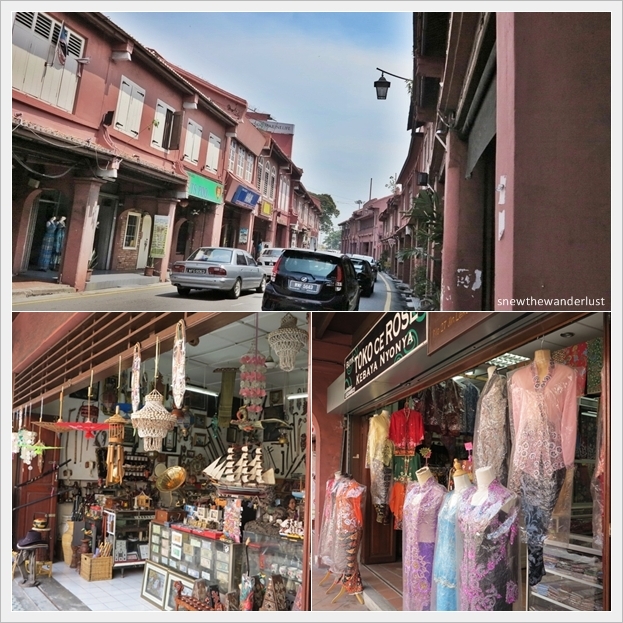 Melaka used to be under the Dutch Colony. I must say, the landscaping is really well-done and well-maintained. I have always not taken much notice of Melaka River, till this trip. The river seems to be much done up now, with the newly opened Casa del Rio boutique hotel. On the opposite side of Casa del Rio hotel, tentages are set up. I'm not sure what was selling there as we did not walk further up to explore. But certainly, the weekend at Melaka was bustling with life at the river side. There's a Maritime Museum along the river, down from the Stadhuys area. The replica of the Portuguese galleon - Flor de La Mar (Flowers of the Seas) is also prominent and one would not possibly miss this sight. I'm no history junkie, so we didn't visit the museum. But we love the photo opportunity with this replica galleon. There's construction under-going along the river, and the opening of Hard Rock Cafe is part of the plan. Other than the Rock Shop, there will be a cafe bar along the river side. There's a rock shop where you can get the usual Hard Rock merchandise are for sale. Back to the river, here are more pictures. Someone said this it has the Venice feel at night. For me who has been to Venice, it's a far cry. A more similar comparison is probably Singapore river, Clarke Quay area. I've yet to take the river cruise, but would definitely try one day, when Hard Rock Cafe and other construction along the riverside has been completed. Was told it would be open at the end of the year.